Ever wondered where the malt that makes our beer comes from? Well, Jo Steward, Suzie Castle and Claire Lacey were invited up to Simpsons Malt with John Keeling to find out exactly that – and The Griffin went with them. After a four hour train journey up north to Berwick-upon-Tweed, the home of Simpsons Malt, we were welcomed by Richard Simpson, himself. No rest for the wicked, we were whisked straight off to see the barley trials. A very unique business model for an independent maltster, Simpsons owns and manages the majority of its supply chain, it’s a reciprocal business. Richard explained it was a business decision based on traceability and provenance – just like Fuller’s, it invests for the long term. We met Andy, Simpsons’ merchant, who talked us through how the barley trials were going and how he works with the local farmers to ensure the right crop is being produced and sold to the company for processing. 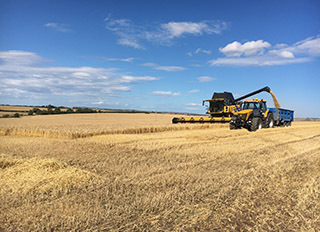 We met one of the farmers who was in middle of harvest and when the offer of a tractor ride and the opportunity to drive a combine harvester came up, how could we possibly decline. Let’s just say you can take the girls out of London, but you can’t take the London out of the girls – Jo’s ability to keep the combine harvester in a straight line left much to be desired and we felt sorry for the guy who had to come along and make the hay bales in a few days’ time – it was a bit wiggly! Off to the Maltings next, where the smell of peat filled our lungs – they had just finished the overnight peat process creating really smoky malt. We wouldn’t normally find this type at Fuller’s, this particular batch was earmarked for a whisky distillery in Scotland. Richard took us on a tour of the entire site and this is where we saw his reciprocal business in action. We were taken to the seed sheds, where they grow seeds and produce the fertilisers to sell to the farmers, who grow and harvest and sell it back to Simpsons as barley. We were then shown round the full malting process. Fuller’s and Simpsons have been in business for decades, dating back to the early 1940s. Our previous maltsters were bombed during the war and so Fuller’s allegedly looked further afield, away from the bombing in London. Nowadays, Fuller’s orders between 1000-2000 tonnes of malt from Simpsons every year. Putting this in context, Simpsons has 14 storage sheds on its site and can hold a total of 60 million tonnes of malt at any one time. So, good news, we won’t run out of malt for your favourite Fuller’s beer any time soon!